There are three things every Australian should know about mangroves. 1. If you like fish and chips, you need mangroves. Mangroves provide the nurseries for the majority of the fish we eat. And they also help sustain marine ecology, filtering phosphorous and nitrogen as it leaches from farmland. By providing this service, mangroves help sustain the Great Barrier Reef despite irresponsible farming practices. Pearls grow bigger, better and faster if they’re cultured beside healthy mangroves. 2. If you live by a mangrove, they can help protect your home. Mangroves bind mud and sand, slowing tidal surges, absorbing wave energy, defending coastal developments from cyclones, storm surges and tsunamis far better – and far more inexpensively – than artificial barriers or groynes. Following the devastating 2004 tsunami, mangroves in Sri Lanka had some timely repair. 3. Mangroves combat Global Warming. They’re extremely effective at sequestering (locking up) atmospheric CO2. But don’t damage or clear mangroves, otherwise they have the reverse effect. The tallest and most beautiful Australian mangroves form closed forest and grow between the Daintree and the Johnstone Rivers, Queensland. 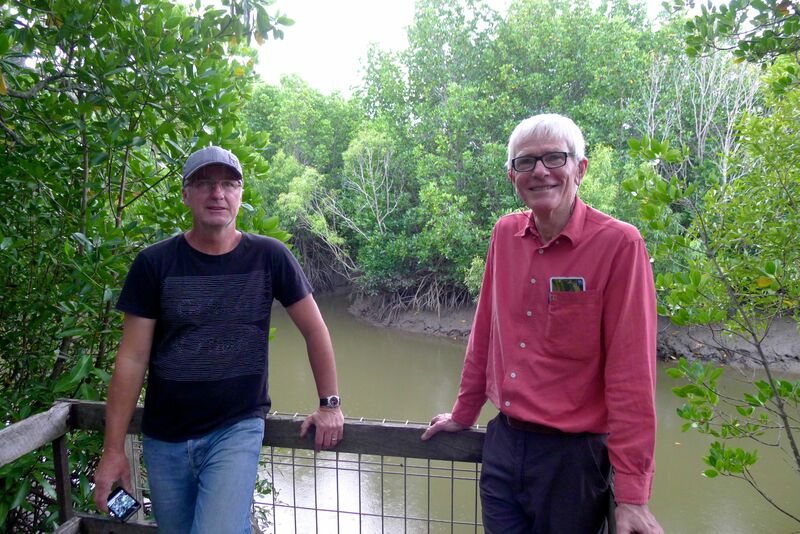 The richest mangroves (in terms of tree species) occurs in north east Queensland, with 39 species and hybrids (was 30 species in 1977 when I bought ‘Mangroves of Australia‘ by R. Lear & Tom Turner, University of Queensland, ISBN 0-7022-1420-5, still an excellent read). In the wet tropics of Queensland, mangroves grow up to 25m high and include 15 plant families – 9 found nowhere else. MyBrisbane suburb has mangroves with two species. I garden on ancient acid sulphate soil. Here is the Gardening Australia segment recorded in 2007 about them. The more southerly mangroves, like those lining parts of Sydney Harbour, only the grey mangrove occurs. Despite its toughness, the grey mangrove becomes dwarfed by winter cold. Mangrove Watch encourages volunteers to assist with conserving Australian mangroves, while this video demonstrates an interesting mangrove planting technique used to replant them around Grand Cayman Island. Here are some new images from my most recent mangrove foray at Cairns and others from the Sunderbans of Bangladesh (UNESCO world heritage site) taken last year. Enjoy some juicy jungle from the world’s largest mangrove.